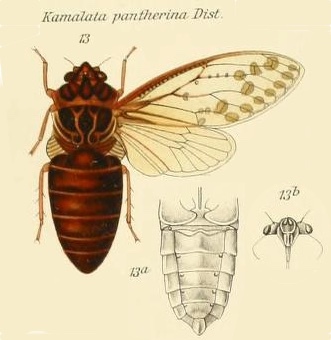 Kamalata pantherina Distant, 1889 is a cicada found in ‎Indonesia. Characters. — Head moderately deflected in front of eyes, its length about equal to space between eyes, its lateral margins discontinuous, the lateral margins of vertex being more or less at right angles to those of front, its width between eyes being distinctly narrower than base of mesonotum ; face globose; pronotum a little shorter than mesonotum. its lateral margins somewhat angulately sinuate, broad and laminate on posterior half; abdomen broad, robust, and moderately inflated, above somewhat laterally oblique on each side, beneath strongly channelled near each lateral margin ; tympanal coverings about as broad but shorter than the tympanal cavities, their length variable, either very short as in K. pantherina or about half the length of cavities as in K. javanensis ; opercula in male short, transverse, not extending beyond base of abdomen; rostrum considerably passing the posterior coxae; anterior femora strongly spined beneath ; tegmina and wings hyaline, the first maculate, variable in length, about as long as body, as in K. pantherina, or longer than body, as in K. javanensis, basal cell longer than broad ; apical areas eight. Body above and beneath dark chocolate-brown ; head with a longitudinal fascia to front, the margins and a transverse fascia to the ampliations in front of eyes, and a transverse spot at anterior margin of vertex, behind which are two outwardly curved lineate spots ochraceous, eyes luteous; pronotum with a central black hour-glass-shaped fascia somewhat margined and streaked with ochraceous, the posterior margin also ochraceous; mesonotum with two longitudinal waved linear fasciae, between which near anterior margin are two oblique spots, and the cruciform elevation, ochraceous; abdominal segmental margins ochraceous; apices of the femora luteous, anterior and posterior tibia) annulated at base, and the intermediate tibiae both at base and apex with fuscous. Tegmina pale greenish-ochraceous-hyaline, the venation brownish-ochraceous; a large pale fuscous spot at bases of second, third, fourth, fifth, and seventh apical areas, some small spots at bases of sixth and eighth apical areas, two very small spots on the margins of third ulnar area, and a series of large marginal spots at the apices of the longitudinal veins to apical areas. Wings pale hyaline, the venation brownish-ochraceous. Long. excl. tegm. [male] , 34 millim. Exp. tegm. 75 millim. 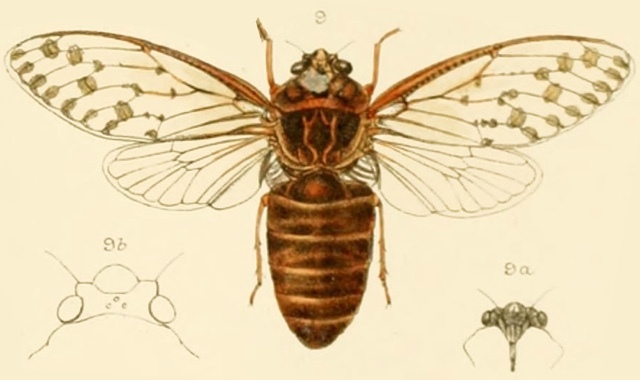 The first illustration and the genus description comes from the journal Genera Insectorum, and a specific article from 1914 by W. L. Distant titled Homoptera. Fam. Cicadidae, Subfam, Gaeaninae. Read it on the Biodiversity Heritage Library website. The second illustration, description and location information comes from A Monograph of Oriental Cicadas by W. L. Distant. 1889-1892. Read it on the Biodiversity Heritage Library website. Name verification comes from Allen Sanborn’s Catalogue of the Cicadoidea (Hemiptera: Auchenorrhyncha).